I recently discovered being good at organizing can actually be really bad. That may seem a bit extreme but let me explain how I came to this conclusion, and you might find yourself saying, “ohhhh” by the end. We can be oblivious. In this mindset, it’s typical to collect this or that while ignoring how full surrounding spaces become. Then, you find yourself rebuying what you need because you can’t find it when you need it. Not so great, and a very typical result of the super busy student, parent or professional. Most of us have been here or are here right now. We can also get on the bandwagon to the latest trends. Current ones inspiring many of us include Swedish Death Cleaning, Hygge, and Minimalism. Each has a unique approach with some elements complimenting each other and all of them are unified with the message to become fully aware of your space and stuff. They all seem great, especially when freshly complete, but then we struggle maintaining them as a daily, long-term lifestyle. In addition, I love fashion and am excited by fresh and timeless looks, so this preference has also caused my staple set of clothes to grow slightly. As of a few years ago, a pair of ripped jeans is now a staple in my closet. Anyone with me on that? With the extra stuff, I used to organize it really neat, tuck items away in drawers, stack and fold these extras on a shelf or in uniform pretty boxes. With everything clean and tidy looking it is near impossible to notice the growing number of items amassing all over again right under my tidy little hands. I learned I have a knack for reorganizing the addition of new items into the same space in a way that didn’t feel like there were any new items. Handy, clever and amazing right? No. It was like a game of closet origami I didn’t even realize I was playing. This is why organizing can be bad. I once heard the saying, “If you need more boxes for your stuff, you have too much stuff” and everything clicked. I had made everything so neat and tidy that I missed the whole point to be aware of my belongings. I took an account, a real account, of my closet and realized I needed to go KonMari all over again, pulling everything out into a massive pile and feeling the sheer size of the belongings I had amassed. Yet, I knew that wasn’t the real answer. I had done that before, a handful of times. It was officially a cyclical pattern. I wanted to prevent the accumulation in the first place. So, beyond just embracing a healthy mindset around belongings, I desired ongoing strategies that I can be doing all the time to keep my closet under control. I have tried numerous clothing strategies. My least favorite strategy was the Uniform. In this one you select an outfit you want to wear every day and buy multiples of the same thing. The most obvious benefits are you never spend time wondering what to wear, you don’t waste money on extraneous items and you minimize your textile waste impact on the planet. However, I am a woman and sometimes (ahem, monthly) I feel bloated and meh, sometimes I want my clothes to be simple and functional and other times I feel my best and seek a vibrant color to compliment my uplifted mood. This is not unreasonable. This is also not at odds with minimalism. You can be a minimalist and still have a fashionable and varied closet. They are not mutually exclusive. 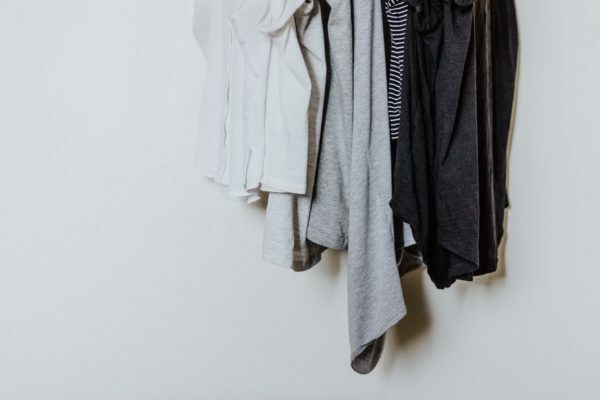 After trying out all the diverse strategies, I have embraced the below five habits and effectively keep my closet fashionable and minimal year after year. This strategy helps you get real with your closet in one of the easiest and quickest habits. Turn all your hangers around backward. Every time you wear an item put it back in your closet with the hanger forward. Select the timeline that works for you between 1-3 months, seasonal or yearly. Mark the date in your calendar. On that date, any items that still have the hanger backward should be tried on again and reviewed as a keep or donation item. Then, flip all the hangers around again and start over. This ongoing habit makes sure you are actually wearing your items and only keep the items you truly enjoy. This might seem weird, but it means exactly what you’re thinking. Literally count all clothing items in your closet. This includes folded and hanging items as well as jackets and shoes. It's fun to guess how many items you think you have before you actually count. I remember I thought I had around 100 items. I actually had 289 the first time I consciously counted. Eek. Could you discover that you have more than 365 articles of clothes? Sounds like ALOT right? The closet is an illusion. 365 is a lot, but won’t seem like a lot until you count it and then realize you won’t re-wear every single item twice or wear them all even once each in a year. It’s a near mathematically improbability. Ok, maybe you’re better then I was and only have half a year worth, about 182. This is a more reasonable number of items but still means that you won't wear these items more than a handful of times in a full year. In reality, there will be the favorites that you will wear repeatedly and for the rest, you will most likely get bored or grow out of a lot of these items before they wear out. Once you have discovered your closet article number, look at your belongings and pick a lower more reasonable number to minimize down to and then unrelentingly stick to keeping only that number of items. For reference, one of The Minimalists counted 187 combined clothing items. He included every clothing item like undershirts, boxers, socks, shoes, belts, belts, jeans, hoodies, all the clothes. That is the number that he discovered he has and works for him but he admitted to cheating a bit when he counted because it was a bit overwhelming to realize how much stuff he had even as a minimalist. My number is more then 187 because I like a bit of variety, I enjoy fashion and I know that if I went down to 187 items today I would likely shop and replace items defeating the whole purpose of being conscious around my consumption. So, once you get a number, start where it’s reasonable for you and in the area of your closet that you are ready to tackle. Shoes first, or just pants first or go complete KonMari and take everything out and rip the band-aid off. It's up to you, but ultimately remember to apply this in a way that is helpful, motivating and most importantly sustainable for you. If you’re wondering what my number is, well, my number keeps getting smaller with a new ambitious goal this year of 100 clothing items. This includes all hanging items (sweaters, shirts, dresses, skirts), folded pants, coats (I do have more than 1) but does not count my accessories, undergarments, workout clothes, sleepwear or cozy clothes which actually do amount to at least double and are levels I aim to tackle section by section. This habit is another really easy to incorporate strategy. Every time you get a new item, remove an item. It works best when it is the same category. Ex: If you buy a pair of shoes you remove a pair of shoes. This one keeps you in check and makes sure your closet doesn’t continue to grow while you are working on getting a handle on all your stuff and very effective when coupled with Habit 1. Honestly, this is an absolute must-try for anyone that is truly interested in committing to limit their consumption and being more conscious of their stuff. This is something I have discovered works amazing for me since I like fashion and variety! As mentioned above, the Uniform clothing style didn’t work for me, but this strategy made a big positive difference, especially over time. Arranging clothes by color and type of item (long sleeve, short sleeve, dress, skirt, etc) immediately teaches you about your style and preferences. Arranging it this way allows you to see at a glance your style and color preferences as well as the parts of your closet that you might already have duplicates. When you stick to this closet style over time you find your clothes are being regularly worn because you are clear what you like, your purchases reflect that and your closet develops into a personalized set that you wear and feel really good about. Ultimately, fewer items are removed over time unless they are falling apart and actually need to be replaced. The best part of this habit for me was that ever since I did this, it has prevented me from unknowingly buying similar items to things I already own. 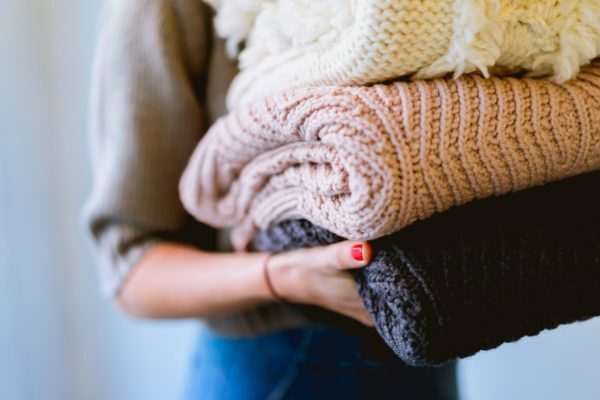 A set of similar items are more likely to be unworn, a waste of resources and you will typically have your favorite item among similar sets, making the remainder of the set underutilized and excess. Lastly, seeing my closet like this has made me aware of areas that I actually do want but don’t have. I used to wear the color green a lot, I have green eyes and I feel it looks really nice on me. After a few years habitually clearing and keeping my closet to a set of items I wear and use I didn’t realize I had phased out all my green clothes that had worn out or had shrunk in the wash (ahem, the wash is clearly why they were suddenly too small). So, when I got below my allotted number of items I liked to keep I was excited to bring in an item that was green. By identifying and bringing in specifically a green item, a color I knew I liked and didn’t have at that time, it filled a hole and ensured that the new item will be a long term keeper. This might be one of the most important habits on the list. Why? Well, it can feel addictively amazing to purge, fill bags of stuff and take it to the nearest donation center. I have been guilty of this. I over purged so much at one point that I ended up needing to go shopping for a warm sweater as the winter hit because I didn’t have a warm sweater. Oops. To prevent this in many areas of your closet, especially in the beginning of creating these habits, try the following. When you have a box of donations, close it up and store it for 1-3 months or a season. During this time do not go shopping. After your preferred set of time has passed revisit your box like a shopping spree of items that you already own. This works really well with the items collected from the one in – one out rule and the flipped hanger habit. The most amazing thing is going back through your items you were going to donate and falling in love with them again, reintroducing them to your closet with renewed appreciation. If you don’t fall in love with them or you look at the items like they are foreign to you and you don’t remember ever owning them, pay close attention to the styles, shapes, and colors so you don’t make the same purchase mistakes again, then officially donate these items. I do these religiously, all the time and am amazed how clear I have gotten on my style preferences, how I've found I am not purchasing things that I don’t end up loving and get wasted in the long term and my favorite part is I have been able to find a closet balance between minimal and fashionable that works for me while being conscious of my impact on the planet. Hope these have offered you some new, easy to incorporate habits and at the very least, I hope you try 1, dedicate to it and let me know if you notice any changes. I am counting on it that you will feel the difference! What are your go-to organizing methods? Share with us in the comments below. What is ‘Swedish death cleaning' and should you be doing it? I like to keep things organized but I can’t follow the minimalist philosophy in all areas of my belongings. I do the seasonal cleanup through my clothes and have gotten rid of excess. By excess, I mean those clothes that have reached their shelf life, as I buy mostly classic style, so I am not bothered by trends and I buy items for their quality. I don’t buy clothing for fashion sake but because I need to replace an item. This coming spring, I will probably throw out any tops that are either too worn or I will never wear again. I don’t donate because of the Thrift shops in my area have become extremely selective in what they take because their buyers are those who resell for a higher cost and they only want “in fashion” items, and classic items aren’t. I love me a neat space especially the closet because it makes selection far easier. Color coordinating is a must and I always eliminate items if new ones come in. Sometimes, I even eliminate it before, knowing it’s past its time, and voila, I find a replacement that fits better or one with less wear! Happy sorting and selecting!